How do people retain a proper posture when when sitting, standing, and walking? Here I am referring to a posture that is not overly stiff (like with high, tense, shoulders), but also not slouching. find the right posture for oneself? keep up the right posture? Additional update: does proper breathing have anything to do with keeping up a good posture, and if so, how does that work? I find that posture comes from strength in the right areas. A strong back tends to pull your shoulders back, which pushes your chest up. Your abdominal muscles create a solid wall up front, which keeps you upright. A strong lower back also helps to rock your chest up and keep you upright. A lot of poor posture is caused by anterior pelvic tilt, typically from spending too much time sitting in chairs, things that should be tight are loose, and things that should be loose are tight. You can read up on fixing them here, and a lot of it comes down to strength training. The big compound barbell lifts like back squat, over head press, deadlift, and row will do magical things for your posture (and much else). I'd recommend checking out Starting Strength or Strong Lifts 5x5. Additionally, try not to fall into the "23/1 trap", where you have one hour a day of great training and then spend the rest of your day causing the same problems to your body that got you into the mess. Walk more. Whatever you have to do, spend more time on your feet moving around. Try to get an adjustable stand up desk. The kind you can raise up for a bit and then drop back down when you like. Get up and move as much as possible. It will be a little weird to do squats at your desk, but you honestly need to pick between being the weird fitness guy and being the slob with bad posture. There's not a lot of middle ground especially as you get older. If your muscles are developed in a balanced way (courtesy of those programs I linked and which incorporate the lifts above), you stay active, and you move around, you'll have terrific posture. I think the key to good posture is balance. The balance between muscle length or flexibility, strength and joint alignment all contribute to a rather effortless posture. Any imbalance requires additional energy to compensate for a joint or muscle's restriction as part of the body works against the pull of gravity. Well aligned posture begins at the feet in standing. Bearing weight either too far towards the ball of your foot or too much towards the heel will throw off the position and alignment of the pelvis, spine, shoulders and head. In sitting, well aligned posture begins at the "sits" bones or the ischial tuberosities. Weight bearing too far back on the tail bone puts the pelvis on a tilt, flexes the spine, depresses the chest, creates laxity in the abs and throws the head and shoulders forward. Weight bearing more on one side than the other throws everything off in the frontal plane. Some of the best ways to achieve good posture is with sensory input to "feel" the proper alignment for your body. When the feel is right you actually feel lighter as if a force opposing gravity is lifting through your legs, spine and head. Sometimes it takes a practitioner to help you find your best alignment. Disciplines such as yoga and Tai Chi contribute to the feel of good alignment. The answer to: I have extremely bad posture, what can I do? gives a lot of practical information about exercises for balancing out typical postural problems such as tight hip flexors and pecs, weak abs and scapular muscles, and how to weave these into your exercise routine and work day. If you have specific restrictions, having bodywork or using a foam roller can help you achieve the range you need to achieve a balanced posture. Stress can cause postural imbalances. For example, stress can cause tightening of the neck and shoulder muscles. As the shoulders hike up with stress this throws off the scapular position. Using diaphragmatic breathing can help to reduce tension. To begin with you will need reminders throughout your day, but as your body begins to enjoy the feel of better alignment it becomes more automatic. What is the correct posture to support my weight with my arms while biking? 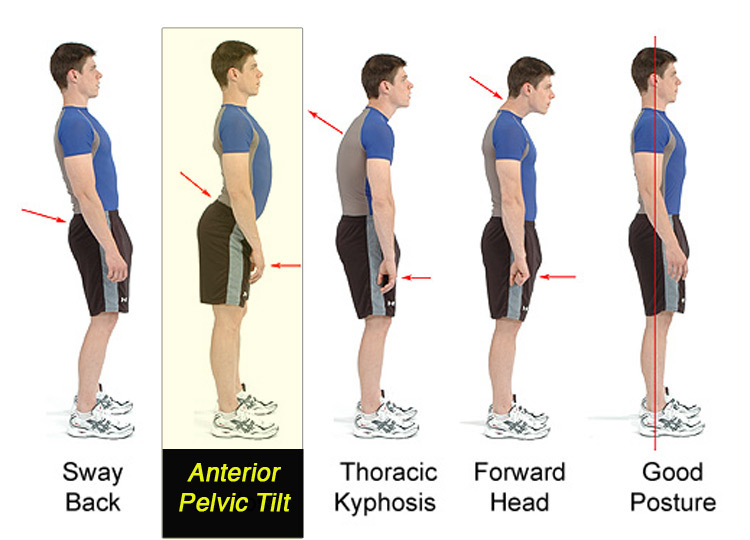 Should maintaining neutral sitting posture be tiring for someone trying to fix anterior pelvic tilt?